Keeping fit is as much a part of looking after our body as the food we eat. As a regular reader, you’ll know that I’m making efforts now to return to a better level of fitness. Join me if you’re looking to find a partner to encourage you to improve your own fitness. We’re in this together! The lymphatic system is like an overflow valve for the body. Most of the blood pumping through your body travels through your arteries, capillaries and back into the heart through your veins. The lymphatic system is a system of something similar to vessels, except they don’t have muscular walls, as do our big arteries. All excess fluid travels into your lymph system, which then grabs the fluid and ultimately returns it back into the venous system via a big duct in your chest called the thoracic duct. The thoracic duct collects lymph from both legs, your abdomen, left arm and left sides of your heart and chest. It’s a hard working duct! The fluid travelling through your lymph system also travels through your spleen, thymus, tonsils and adenoids, all of which are considered to be part of the lymphatic system). Lymphocytes (the main cells in the lymphatic system) are the cells that recognise pathogens, viruses and bacteria and things that are considered ‘non-self’ in our body and help us to build immunity. When we have an immune deficiency disorder, it’s this system that is affected. So, in effect, the lymphatic system is like the body’s own oil filter. 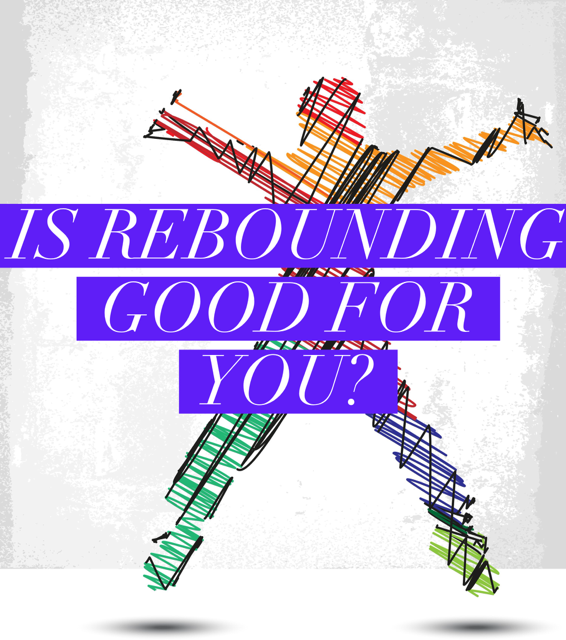 So Why Is Rebounding Good For Us? Remember I mentioned earlier that the lymphatic system doesn’t have the benefit of a muscular structure to surround it, as do our arteries and heart? Without this structure in place, the lymphatic system relies on the skeleton for that benefit. Therefore, by simply walking, we are compressing muscles in our thighs and with that simple action we are pushing lymph through our body. It’s then passed through the body by other muscular action. In turn, by jumping on a trampoline, you’re helping your muscles to contract and you’re helping lymphatic drainage. Instead of allowing pressure to build in the ankles, you’re helping to release it and forcibly pushing it up through the body. Sometimes when people get blood pressure or heart troubles, they may also have swollen ankles because the pressure differential pushes the excess fluid to the ankles, especially if they are leading a sedentary life, which can leave the lymph system unable to keep up with its work. This article has been written, employing content from the video below. There’s more information in the video and I’ve added some extra notes in this article, to explain a couple of the points more clearly. I bought this series on looking after ourselves in a way that can help to prevent cancer and will, in time, share more with you. Much of it isn’t available on the internet. In essence, rebounding will get your entire lymphatic system working and help to detoxify your body. If you’re looking to start a simple exercise routine at home, this is the kit I invested in. It’s a great price point and great quality! Here’s the rebounder. It’s small, near to the ground, sturdy and just the right size for a small or large space. I’m working through this DVD, which offers a series of workouts, rising in difficulty. I’m still on workout number 1! Join me and let me know how you get on!! As you know, Becky, who filmed this series, is super helpful and knows how to encourage beginners to get started. I can highly recommend this DVD. I’ve done the first two workouts and will no doubt be on Periscope soon, demonstrating how the workout looks. See you tomorrow, for last week’s fitness update! This is really cool, way to go. Keep your hard work up! Yayyyyyy! We’re going to hula hoop on Periscope this Friday too Nicole. Maybe join my group of Peri friends and have a giggle with us there. I’ll rebound on scope one day too. One step at a time though. Ha ha.